Authored by asensi on Jul 5 2018, 3:46 PM. After Alex Bikadorov added a -d parameter that to Krusader, after reading what Jan Lepper wrote in https://bugs.kde.org/show_bug.cgi?id=281917#c7, and after reading the comments of "Bug 384653 - [zip kioslave] Journal spammed with “kf5.kio.core: error() called twice! Please fix the KIO slave”: The KrDebugLogger system was adapted and improved, and some related changes were made. trying to load "/usr/lib/x86_64-linux-gnu/qt5/plugins/kio_krarc.so" from "/usr/lib/x86_64-linux-gnu/qt5/plugins/kio_krarc.so"
With that information, Alice can add more code so that more messages are written in the trace log. Finally, Bob sees that, using the new code, KIso::readParams() has not been used (but previously it was), and so Bob realizes that there's a problem. Create a trace log using export KDE_FORK_SLAVES=true; krusader -d and then entering into compressed files. 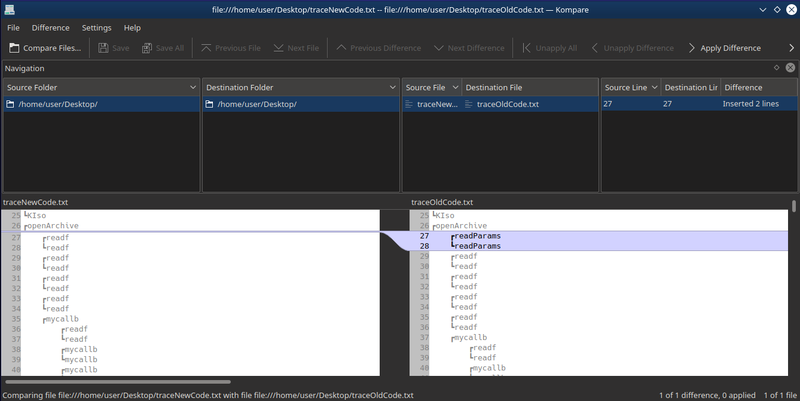 Add KRDEBUG lines, add KRFUNC lines code to the code of Krusader, and to the code of the iso and krarc kioslaves, compile and execute Krusader, and watch what is written to the trace log. Create trace logs but using KRDEBUG_BRIEF=true previously, compare those trace logs, etc. Toni, this sounds like a great change! Thanks for working on this! Quick question: during testing we also need to install Krusader to a standard location, otherwise the app will load old kiso and krarc modules, correct? I'll try to find some time to understand the change and the Krusader debug system soon. Thanks, Nikita. I'm not aware of a way to choose the kioslave modules that are going to be used, if it may help: to debug a kioslave what I did was using a virtual machine, where I was able to use the standard places for Krusader. I remember about this CR, however my VM is currently crashing on restore. I need to figure out what's wrong.